Why not use the BA Contemptor? IIRC the Custodes dread is quite a bit larger than the Contemptor which again is larger than the Libby dread. The Achillus.... ooooh, goodie, that is a wonderful base. I've seen this frame used as a Libby Dread in some YouTube reports, but it was barely touched in terms of BA-ification. Still it looked awesome. So far I've managed to do some good work on the legs and torso. What I'm still struggling to set my mind on is the halberd-hand. More pics in my WIP thread. I hope to move the project in a few days. Best of luck with your project! I'm sure it will be something to behold! Edited by Majkhel, 02 January 2019 - 07:15 AM. 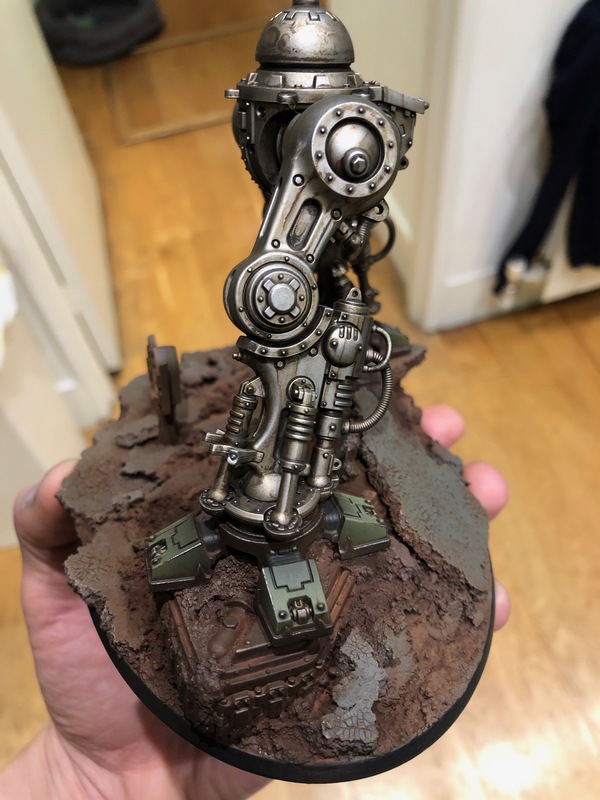 Neonmole - I was literally in the process of doing just that with the Custodes! Long time til the order gets here, so you might finish before me, but after researching price/the contemptor chassis, I decided on the same thing. Can’t wait to see what you do! That’s super promising looking Majkhel! Thanks for sharing. I definitely considered using that guy as a base, but I was really put off by the chopping to overcome the posability, but it looks like you have conquered that! @Quixus - I really don’t like the 30k BA stuff FW sells. It’s reallt over the top for me, and that’s epsecially true when you contrast it with Primaris, which is the rest of my army! Edited by neonmole, 31 December 2018 - 02:59 PM. So a very hard game 1. I managed to draw this one in the end, which I was very happy with. Some highlights included my smash captain destroying his knight... and it subsequently getting back up! Which happened twice more this game - meaning I had to kill a single knight 3 times! And it continues at full efficiency of course with the use of stratagems. I didn’t have too much left on the board at the end of the game, but did enough to walk away with a draw, and 10 pts. Kinda a necro but a friend of mine is about to face a Knight for the first time and was asking for help. Aside of me and another friend basically telling him that his Space Wolve collection isn't enough to deal with one and he should better go with his more extensive Astra Militarum collection there was one thing I wanted to warn him about as well and that's the reviving Knight you mentioned ... however I couldn't find such a Stratagem in the Codex at all? All I could find was one Stratagem that allows a Knight, if he didn't explode, to shoot or fight one more time as if it had 1 wound left before getting removed. Could it be your opponent, knowingly or unkowingly, kinda screwed you over there? It's a specific House Taranis strat. Basically, Our Darkest Hour (3 CP): Use when one of your models dies and doesn’t explode. Roll a dice, on a 4+, the knight gets back up with d3 wounds left. Ah there it is! Thanks a lot! It's probably the harshest example of what WAAC soup detachments can do with CP generation. 19 CP means he could do it three times and still have 10 CP left for other shenanigans. Yeah he would still have enough CP even after re-rolling that 1d6 each time. I’m not a fan of IK. Short update, bit of hobby, bit of gaming! The first part of that I finished last night! Just in time for a practice game, also played yesterday evening! - Maybe some other bits? We were playing mission 1 from the new CA eternal war, which is a fairly straightforward progressive scoring mission - but this didn't end up mattering very much in the end. He had unfortunately left a gap in his backfield, which allowed me to UwoF/DoA my Smash Captain into his Reapers, which he promptly made into burger meat. I was also able to delete one of the spear units with all of my firepower, leaving him with 2 of his key units dead, and the army left with most of its teeth knocked out. Looking very good for me now! To cut a long story short, his turn 2 wasn't great. 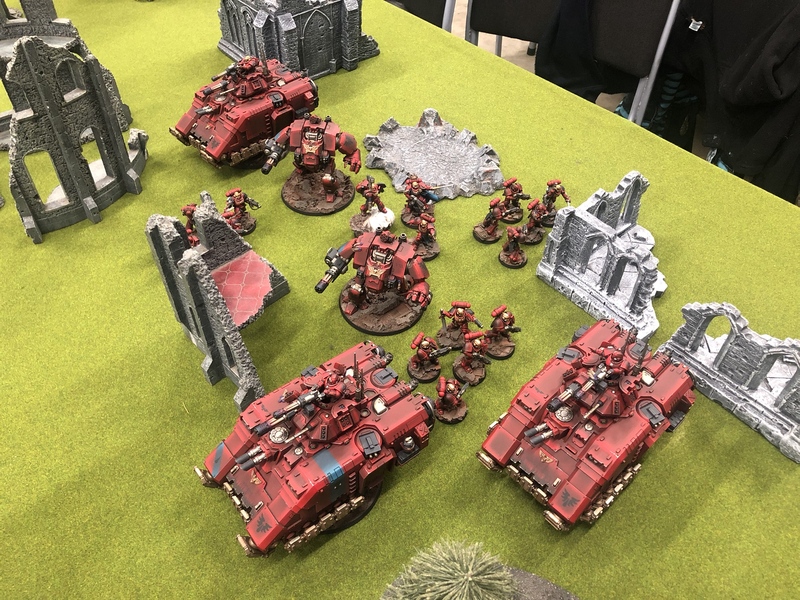 Specifically he failed to cast Quicken on his second Spear unit leaving them in the open, and easy pickings for my guns... From here, downhill for the Pointy Ears, and a swift dispensing of the Emperors mercy to the Xenos! He concedes, which would give me a max points win! So great result for me, and the Spear of Baal continues to perform way above expectations! Roll on Heat 4! Next on the hobby table will be my Captain with Powerfist model who is the final bit of painting to complete this list, followed by the Librarians I mentioned before! Interesting choice to go with HOG over Lastalon. I imagine it can work out because you still have 6 very resilient Lascannons and all the melee potential from the Captain and the two Redemptor Dreads. I'm not sure that much S5 AP-1 is needed against most lists tho ... maybe against Orks and soon GSC but that's kind of a gamble since the meta is still in process of adjusting to those armies I think. Anyway congratulations to your win! - you have powerful AT elsewhere in this list, specifically the smash captain will reliably kill a hard target of your choice. In addition as you say, the dreadnoughts in melee (which happens more often than you think as Repulsors need to be the priority for the opponent). Plus of course, you still have the 6 lascannons, with their good range. Phew! Much more than I intended to write! But useful as this was as much me thinking through my own reasons as it was me explaining it! It's definitely a tough choice, and your draws in terms of matchups will likely dictate whether its the right call or not, but overall I am pretty sure its overall the better choice for this list. Edited by neonmole, 11 January 2019 - 11:41 AM. I'm curious as to how you removed the las-talons from fully painted repulsors to replace them with the onslaughts. Based on what he said it sounds like the las-talons were glued in then removed to insert the heavy onslaught cannons. I think it would be pretty hard to remove the las-talons without damaging the model once glued in. This is true Lemondish! They absolutely are cooler! As far as the refit goes, super easy, no magnets even needed! Basically the base of the Repulsor turret (the bit that fits into the hole on the top of the tank) holds the main weapon in place when attached to the top half of the turret. The cool thing is you don’t actually have to glue the base/top of the turret together, the fit is actually super tight just snapped in. So much so that it was actually tricky to get it popped out again. This obviouslg means that you can just pop the turret a apart, and change the gun at any time! Assuming of course you thought about it during the build, as the instructions do say to use glue. Good job on the Repulsors. Congratulations on your victory. Cool, thanks. I will be running a similar list on Wednesday and hopefully I will put up a few pics. With all the point drops in Chapter Approved, have you made any changes to your list? Would assume you have been able to fit more in now. What have you brought in or moved out? Hey neon - how did you paint that stone head for your captain? Trying to find a good stone color I like, and loved your scheme! Sorry been AWOL for a little while! Life has just been mad recently! 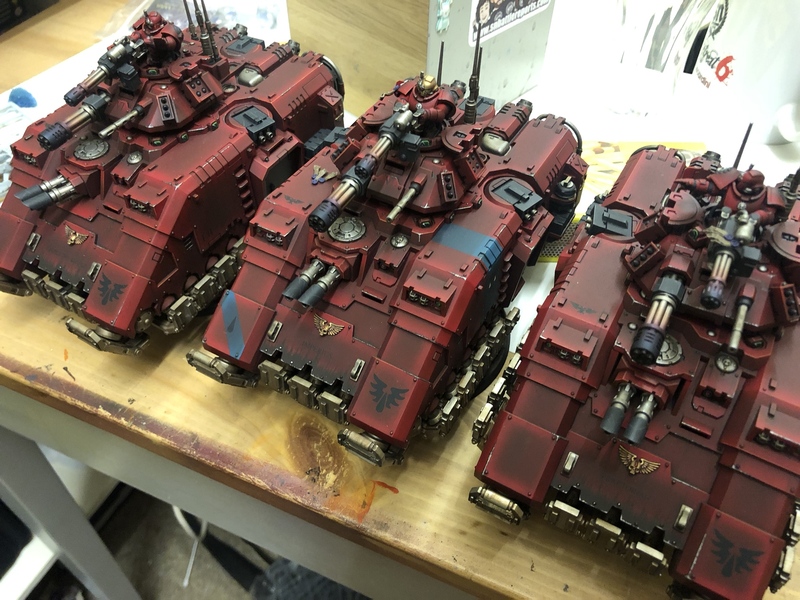 @ PaladinStormlord - the Redemptors were added to the 1750 list when CA happened! @ Keebler - The stone head was basically a basecoat of various greys (couldn't tell you precisely - just whatever I had on the table at the time!) airbrushed up to an off-white. After that I used weathering powders to create the shade/dirt effects. I came in afterwards I think with the airbrush again a little bit to bring out the sharpest highlights. In terms of progress from my side... Happy to report that I have done precisely NONE of the things I was intending to when I last posted... ho-hum. Though some of those things are in various stages of WIP! What I actually have started is painting a Knight Gallant that I intend to ally into my BA on occasion. I'm not sure how frequently I will actually use him, but I have really wanted to paint a knight for a long time, and figured what the hell! In terms of style, I am going for a more industrial "war-machine" kind of look, dialling the "knightly heraldry" stuff way back. This look is something I have wanted to see applied to a knight forever, and is very much inspired by the look of Titans back in the days of Epic 40k (or Epic Armageddon as it was later known). 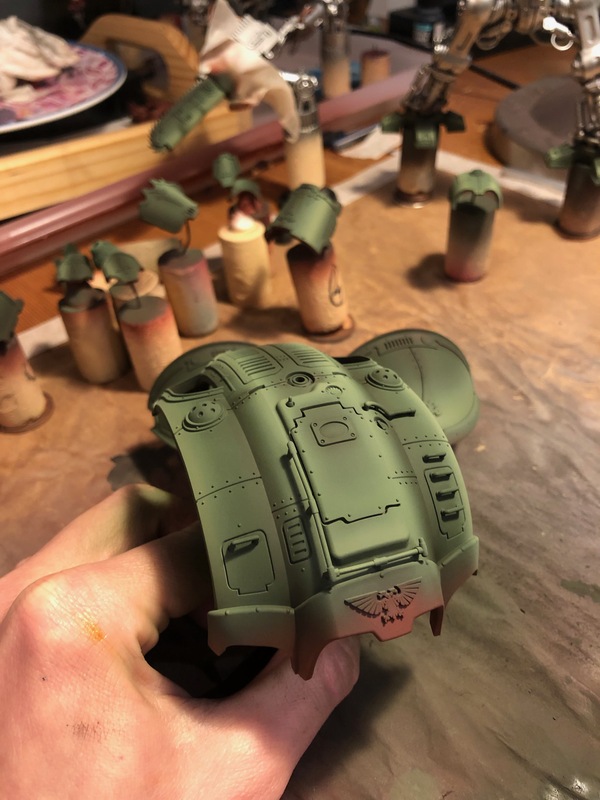 Back then the Warlord titan was this olive drab green, and quite angular and industrial looking compared with the one you see today in Titanic or the 40k FW one. Quick google of "epic 40k warlord" you will see what I mean! Now I think on it this was also the look of the Warlord Titan in the Inferno comic book series (which was awesome by the way...), can't think what that was called now... Dan Abnett did it maybe? 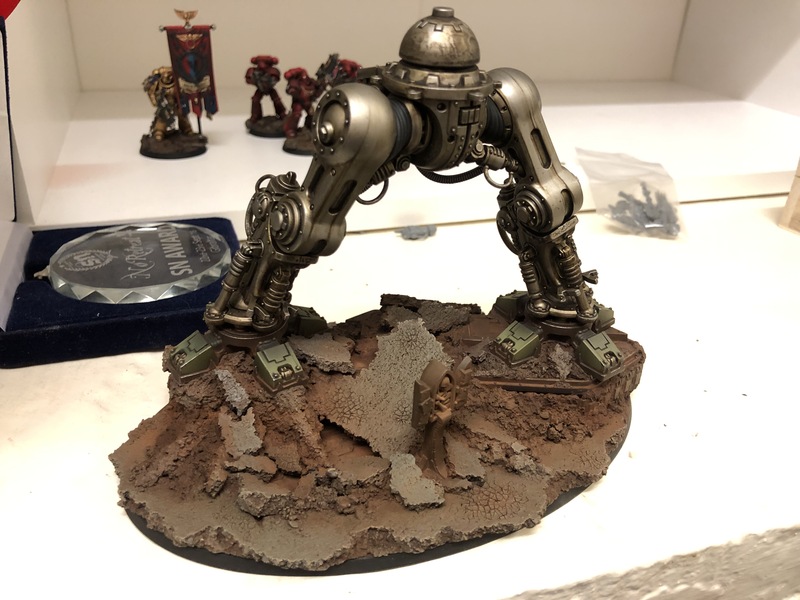 Here is my progress so far, legs & a base! And here is a WiP of the top armour plate to give you a feel of how that is looking! Happy with how he's going so far, but man... I really underestimated the amount of work a knight would be! Its taking forever! In terms of what's next hobby wise... I will probably finish 2 Primaris characters that I currently have half way finished - a Librarian and an Apothecary. Love the models so really just want to have them in the collection! After that I think I'm all in on the Vanguard stuff. They are just some of the best models GW has ever done IMO, and I can't wait to play with them too! I think some units (infiltrators being the standout) are actually extremely competitive, going to be a biiiiiiiig boost for marine armies, and BA in particular. 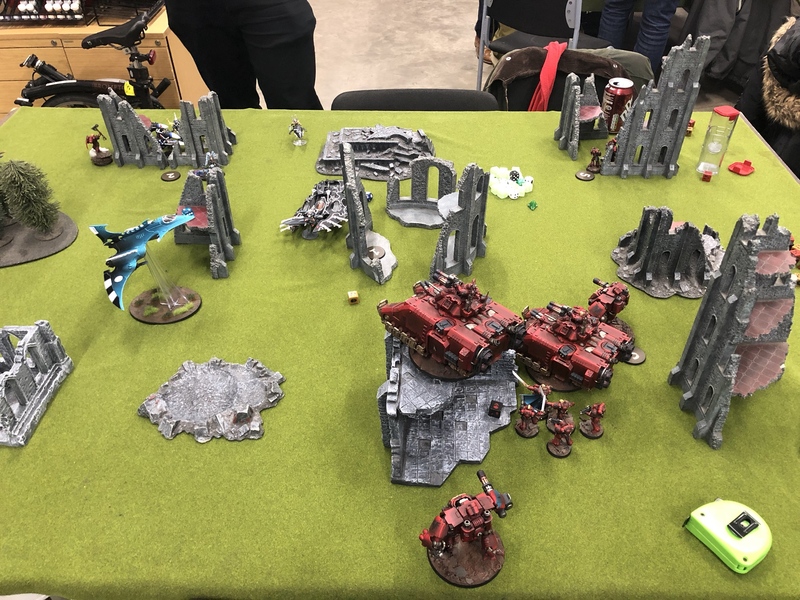 So I attended the GW GT Heat 4 at Warhammer World in Feb, and happy to say that I came 14th! 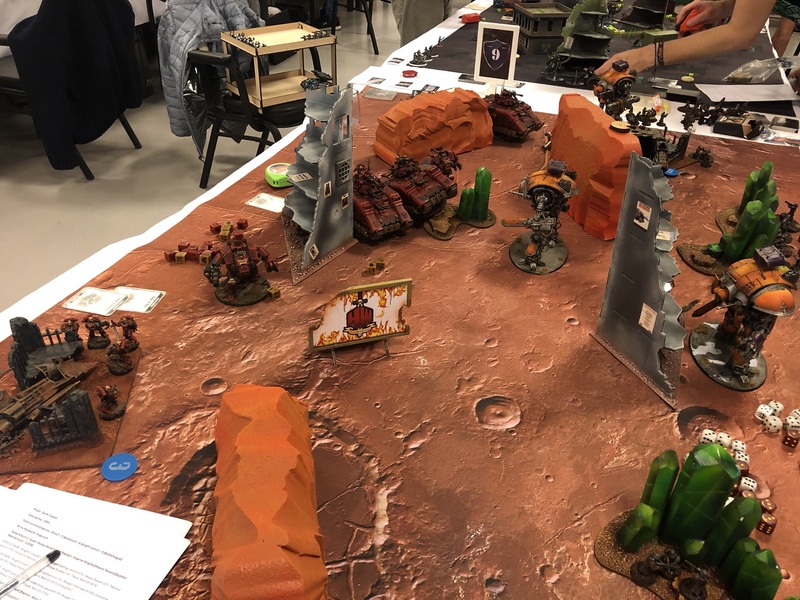 So great result for me, and means that I am qualified (top 30/120~ went through) to the finals, which will be this coming weekend, again at Warhammer World. I didn't take too many pictures of Heat 4, but I'll try and take some at the finals! The Knight's components are well-painted.